Our report on Local government in Scotland: Financial overview 2016/17 was published in November 2017. 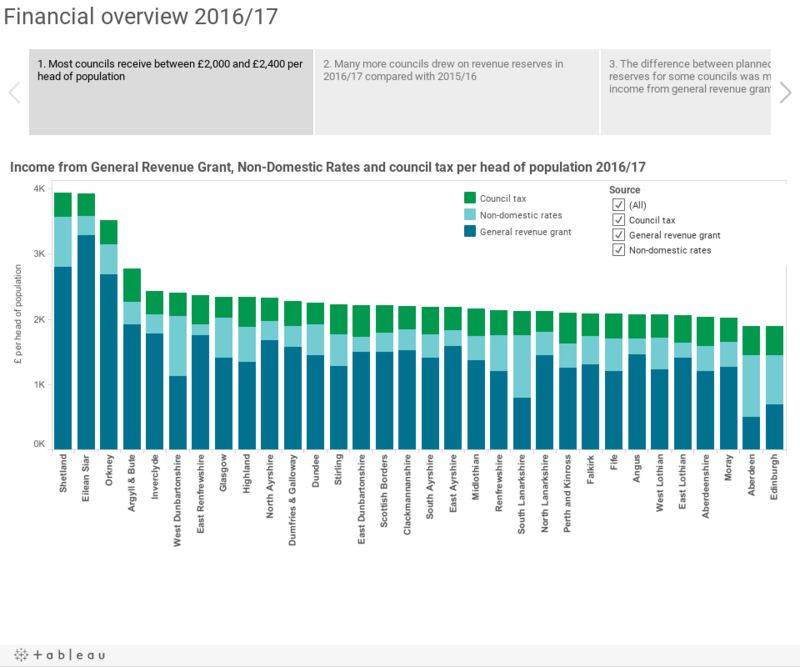 The Tableau visualisation below illustrates councils' income, reserves and revenue costs of general fund borrowing. Councils publish audited annual accounts for each year up until 31 March. Here we have included selected data from the Comprehensive Income and Expenditure Statement, the Movement in Reserves Statement, and the Balance Sheet from the 2016/17 accounts. The population estimates used in Sheet 1 are based on National Records of Scotland mid-year population estimate for 2015. The movement in reserves figures from 2015/16 on Sheet 2 were taken from the 2015/16 audited annual accounts. The information on planned use of reserves in Sheet 3 was taken from returns submitted by auditors . ‘Percentage of income’ in Sheets 2, 3 and 5 refers to income from general government grants and taxation. On Sheet 4, ‘percentage of income’ refers to income from general government grants, taxation, and dwelling rents. Hovering over the map and graphs will give you more detailed information. On Sheet 1 you can filter by sources of income. On Sheet 2 you can compare trends in 2015/16 and 2016/17. On sheet 4 you can filter by different types of reserves. To access the data behind the graphics, click on the graph you're interested in, then click 'Download' at the bottom of the graphics and select the format.